I grew up thinking that no other place mattered but 1st place. That’s how I also felt about plans. There was only plan A and no need for a plan B or C. There was only one way, one path and one road that would make my dreams come true, and up until my last couple of years in college, plan A was working out just fine. Then, all of a sudden life slapped me in the face and things got real. There were many things that I didn’t take into consideration when it came to my plan A. I didn’t expect to take detours or experience road blocks in starting my career. I felt like the formula to success that was given to me was a lie. Panic overcame me because I didn’t have a backup plan for navigating the obstacles. I was determined to make plan A work, but I couldn’t figure out how to get through the hurdle so now I was at a stand still unsure if I should turn back and give up or keep pushing forward. Have you ever been in the middle of a crossroad and not sure have to make your next move? 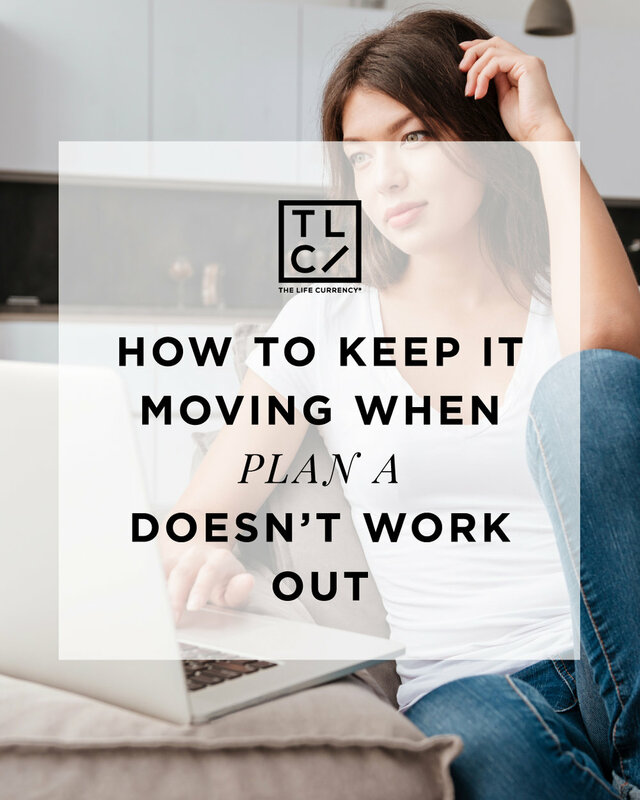 Here are four tips to push forward when plan A doesn’t work out. I had to accept that plan A was not going to work in this situation, and I had to make a decision on whether to stay in NYC to pursue a Public Relations career or return home. Was I going to let the road blocks turn me around and defeat me or was I going to get over the hump? I decided to get through the roadblocks. I learned there are no clear paths to getting the things you want. Sometimes it’s luck, sometimes it’s favor and sometimes it’s timing. Acknowledge that the road ahead won’t be easy and save yourself some disappointment. Nothing worth having is going to be easy. Prepare your mind and spirit to be able to deal with the difficult moments in your journey. Acceptance is the first step to making your plan B. You aren’t always going to be able to walk through a door of opportunity. Our professors, peers, parents and industry professionals say go to school, intern, network and you will have the career you want. What happens when you’ve done all of that and you still don’t have the very thing you desire? Once you have tried everything possible then that’s when you have to find a back door to opportunities. I went on more than 100 job interviews and I was told that I didn’t have what it takes and to try again with a different profession. My persistence and resilience weren't enough for these prospective employers, but I refused to give so I decided to try another way. I knew I was already equipped with the skills that I needed so I started freelancing my way to a full-time opportunity. I continued to build my portfolio by offering my services to other people. I was building my brand and building my expertise without having a Fortune 500 company behind my name. Now that you’ve found a backdoor to your dreams, it may take some time to fully realize them. My first breakthrough in my career came 3 years after I graduated from college. That’s 3 years less time I had in the industry than my peers, and that’s 3 graduating classes of eager recent grads that I had to compete with for entry level opportunities. That means I had a tougher road ahead trying to keep up with my peers in terms of salary, career experience, and opportunities. Therefore, when working on your plan B be mindful of timing. Take the pressure off of yourself to make career marks by certain ages. I’m sure we all thought we would be married at the age of 21 and we aren’t but life kept moving and so did we. It’s not the end of the world if you aren’t a director, vice president or even CEO by 30. Things will happen when it's supposed to. Keep building your experience and your skills by starting a side hustle to get you further along in creating the life you want. Who wants to be knocking on 30s door making a low entry-level salary in NYC? I sure didn’t, but if I stuck to plan A that would have been the road that I was on. Therefore, I decided to increase my skills in an industry that paid much more and promoted much faster in order to make up for those three years that I lost. I opened myself up to another career path andto my surprise I found it to be rewarding. Sometimes if you open yourself up to a new experience you may discover a true passion of yours. We are a generation of “backslasher,” so who says you have to be good at only one thing and get paid for that one thing. If you don’t have the job you want then develop your passions into a side hustle so that you can still build out your purpose and in due time it becomes your bread and butter. So don’t get yourself down, if plan A doesn’t work out. We have to turn those lemons into lemonade by stepping back, reassessing our goals and purpose, and discovering a different route in creating the life we want.